For the past decades, Philippine courts have been experiencing severe court congestion and case backlog problems. This study aims to provide a solution to alleviate these problems by predicting the outcome of court cases. As the Philippine Supreme Court case decisions are the only readily available data online, we use this as our dataset. We use Natural Language Processing, particularly the bag-of-words model to represent the case text into n-grams. Spectral clustering is also used to group these n-grams into topics. These n-gram and topic features are then input to the machine learning algorithms such as linear support vector machines and random forest classifiers. Linear support vector machine results reached 45% on the n-gram datasets and 55% on the topic datasets. The best result we obtained is 59% on the topic datasets using a random forest classifier. 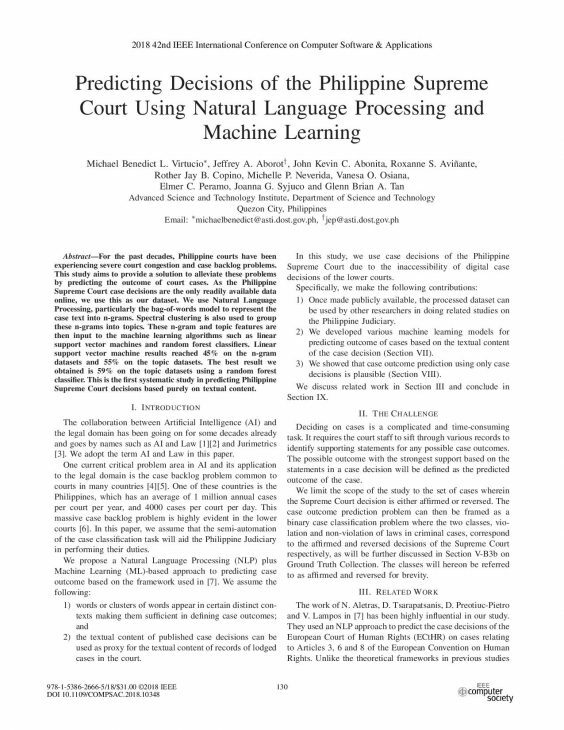 This is the first systematic study in predicting Philippine Supreme Court decisions based purely on textual content. In response to the 8th item (Promote science, technology, and the creative arts to enhance innovation and creative capacity towards self-sustaining, inclusive development) of President Rodrigo Duterte administration’s 10-point economic agenda, the DOST-ASTI instituted the Computer Software Division’s Research and Development team. The team conducts basic and applied research in the creative arts, artificial intelligence, and advanced software development. It also has a diverse competency in management, business analysis, software development, and data analytics.